You’ve flirted with veganism, but have never been able to fully commit. You want to try it out, but you’re not sure where to start. What if you eat cheese accidentally? What if you have a team lunch at a steakhouse and you don’t want things to get too awkward? What if you can’t achieve vegan perfection?! Chill out and take a deep breath. I’m here for you. Something I’m passionate about is supporting people who want to become plant-based, and to that end, I’m writing up a series of “back to basics” posts. If you’ve been considering going vegan but aren’t sure where to begin, I’ve got your back. Read on for five tips on how to go vegan, and please email me (girlinthegarden@gmail.com) if you want to chat further. And if you’re one of my fellow long-time vegheads, rock on. Today, let’s talk about transitioning to a vegan diet and lifestyle. These five guidelines are not the end-all, be-all, of course, but I think they’ll help just about anyone who wants to go veg. Try them out and let me know what you think. Come up with a plan that fits you. Know why you’re making the change. No two people live their lives the exact same way, and no two people will have the same exact motivations and methods when they transition to veganism. If you’re the type of person who makes decisions in a split second and dives straight in, you might do just fine ditching animal products in a single leap and becoming vegan overnight. And that’s awesome. Go you! If you know you’re that kind of person, your transition might involve less planning and more doing. On the other hand, you might be a diehard planner. If schedules and research and preparation are an essential part of your life, you might transition to vegan slowly. And that’s awesome too. Go you! If you fit somewhere in this category, planning will obviously be a larger part of your transition. Personally, I need to ease myself into big life changes. I didn’t become vegan overnight; I spent the better part of a year being vegan in practice but not in name. I needed to show myself I could do it before applying the label and making it official. To be honest, I didn’t want to fail or make a mistake (perfectionist much?). If this sounds familiar, here are some ideas for easing into your transition. Try the “vegan before six” option (or something similar) for a while. Show yourself that you can do it while allowing yourself an out in case you get stressed. Eat vegan on your own, but not necessarily with others. If you go out to a restaurant and your salad is topped with cheese, it’s cool. Don’t broadcast your change to the world until you’re comfortable doing so (not that you ever need to “broadcast” it at all!). Host vegan dinner parties (without necessarily drawing attention to the fact that they’re vegan) to show yourself and others that it’s not so bad being vegan in a crowd. Drink some wine, chat with your friends, and show yourself that your life won’t change all that much just because you aren’t serving a (dairy-based) cheese plate anymore. Cut out animal products by category. Ditch the dairy, then eggs, then honey. Even if you’re the dive-right-in sort of person, do some research as you go. Read up on vegan nutrition. Browse your favorite recipe site for plant-based options. Subscribe to blogs that have lots of recipes that look appealing and doable. Jumping into vegan cooking doesn’t have to be overwhelming, especially if you put a little forethought into the transition. Think about how you like to cook now, and then research how to make it vegan. If you’re the type of person who gets tired after work and wants no-fuss dinner options, make yourself a Google doc or a few Pinterest boards or a bookmark folder (or even a hard-copy binder!) with meals you know you could handle. If you have non-vegan standard meals or staples you feel totally comfortable cooking, look up vegan versions of them (e.g. bean burritos instead of beef burritos, pizza without cheese, spaghetti and non-meatballs). The way you cook doesn’t have to undergo a huge shift once you’re vegan — only the ingredients need change. Preparation is also key when you can’t plan in advance. Road trips, days out with friends, work lunches with suspect catering… lots of opportunities might leave you wondering when (and what!) you’re going to eat next. And if you, like me, tend to find yourself suddenly hungry and suddenly very, very irritable, you’ll want to keep yourself stocked with travel-friendly vegan snacks. 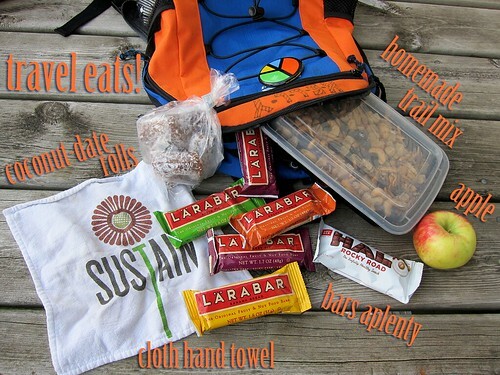 Clif bars, Lara bars, trail mix, and any purse- or glove box-friendly snack will do the trick. Traveling can also set new vegans into a panic, but with a little prep work you’ll be able to keep yourself nourished anywhere on the globe. I have some tips for travel snacks, along with eating guides for a few airports. And if you haven’t checked out HappyCow, hie thee hence without delay! HappyCow is the best resource for finding vegan-friendly eateries all around the world. Despite that perfectionism I mentioned, I am a big believer in personal forgiveness (theoretically, at least — in practice, it can be difficult to apply!). If you accidentally slip up, it’s okay. It happens to everyone. Just because you accidentally ate bread made with margarine that contains a tiny amount of casein or whey doesn’t mean the rest of your commitment is worthless or somehow negated. Nope. That’s not how it works. Even if you consciously eat something you know is suspect, you don’t have to beat yourself up. Live, learn, and move the heck on. Mistakes happen. Yes, the vegan community sometimes gets a bad rap. But in my anecdotal experience, nearly every vegan I know is warm, caring, empathetic (duh? ), and willing to help. If you’re struggling during your transition or you just have questions, reach out! The Post Punk Kitchen forums are a great place to start. I also love the Reddit Vegans Facebook page; it’s one of the most inclusive, welcoming groups I’ve seen. 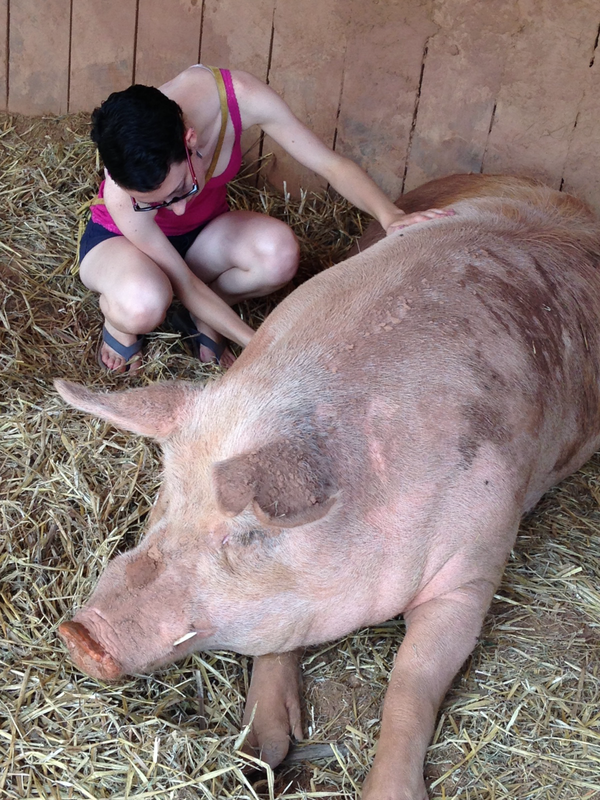 A sweet piggie at Poplar Spring animal sanctuary. Obviously you should know why you’re choosing to go vegan before you commit to it. But I’d argue that it’s just as important — if not more important — to continually remind yourself why you’re doing it and to stay up to date with what’s going on the vegan world. Once you see that first slaughterhouse video, you might be tempted to avoid so much as scrolling past a similar video in the future. But if your resolve starts to flag or you’re getting frustrated that you can’t eat the pancakes at your favorite brunch spot, you might need a kick in the pants to remind you why you made the choice to stop eating animals. Even if your commitment never wanes, it’s still instructive to keep yourself educated. Follow some of your favorite vegan or animal welfare organizations on Facebook, or scour your library for books about the ethics and practice of veganism. You will get into conversations about your choice to eschew animal products, and it can be useful to have a wealth of arguments and knowledge ready for those discussions. So — what do you think? Are these tips helpful? Are you ready to go vegan? Let me know, and remember that you can always ask for help or reassurance if you need it. My email address is in the second paragraph, and I’m always happy to talk.